Ride the rails! 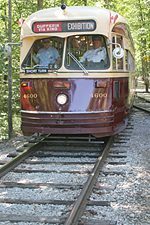 Located at 13629 Guelph Line in Milton, Ontario the Halton County Radial Railway (HCRR) is a full-size operating electric railway and museum, featuring historic electric railcars operating on two kilometers of scenic track. The HCRR is owned and operated by the Ontario Electric Railway Historical Association (OERHA), a non-profit, educational organization. The HCRR is proud to be Ontario’s first and largest electric railway museum.